Hello Lilly Lovers! 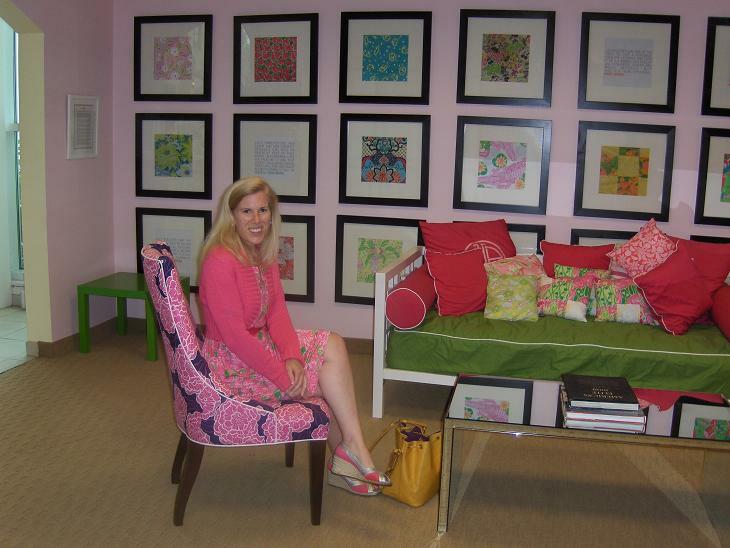 I had the incredible opportunity to visit my personal Mecca, my mother ship. . . . Lilly Pulitzer headquarters a.k.a. the Pink Palace. 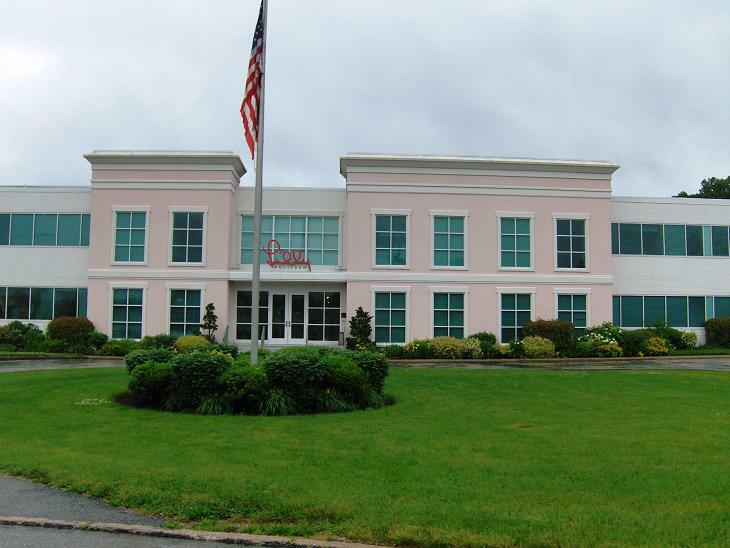 Yes, the building is really pink. It's located in King of Prussia, Pennsylvania, not far from the convention center where the Warehouse Sale takes place every spring and fall. It was the most amazing day. Trisha from Lilly corporate was the hostess for the day. Everyone I met was so friendly and happy to talk about Lilly. We jumped into the Lilly Jeep and were giddy with excitement as we pulled up to the building. Every detail in the building is impeccable and is uniquely Lilly. The lobby area is stunning with framed fabric prints and gorgeous furniture. If I only knew where I could find fabric to make upholster a chair for my living room, I’d be the happiest Lilly lover in the world! Can you spot two of my favorite Lilly prints, Cheery-O and Derby Patch? The framed prints are a fantastic decorating idea for a wall. 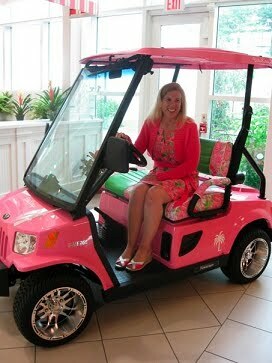 I sat in the electric cart that is now available for sale and fell in love with it. In the central patio area, there is a juice stand and common area where Lilly corporate employees can enjoy a snack or take a break. I enjoyed delightful pink and green cupcakes and yummy treats that the Lilly Peeps had prepared for us. There was even a palm tree that had been transported to the Pink Palace from Florida. I imagined myself working here, eating lunch in the patio area after trying on samples for different accounts. How amazing would that be?!? The print and clothing designers were all hard at work but took time to say hello and talk about their latest ideas. The amount of creativity in the building is beyond words. The smallest feature of each item is carefully determined, down to the type of stone used in a sandal or buttons used on a shirt. I was really impressed that a relatively small team of people are behind all of the designs, styles, and prints at Lilly Pulitzer. Some designers, like Janie, work primarily on creating prints, using colorful inspiration boards and images for ideas. Others design the lines and styles of the dresses, pants, and shirts. There was an entire section full of notions like buttons, beads, and accent pieces. The details are incredible. Wearing Lilly makes me happy and I appreciate the story that each print represents. Lilly Pulitzer as a company impresses me on a deeper level, too, because I really feel that they truly care about their customers and strive to get to know them. My day at the Pink Palace was an unforgettable, once in a lifetime experience and I am so grateful that I had this incredible opportunity. Thanks for reading my blog! Enjoy your day. What a fun day! I bet you had that cute smile all day long! You TOTALLY look like you were born to be there. Melanie! I'd love to plan a MD/DC bloggers gathering this spring. Sounds wonderful! Fun! I've always wanted to visit Lilly HQ!!! Holy pink heaven. LOVE that gorgeous chair! Oh my goodness, thanks for sharing this with us! I feel like I'm now privy to some uber-exciting Lilly secrets.